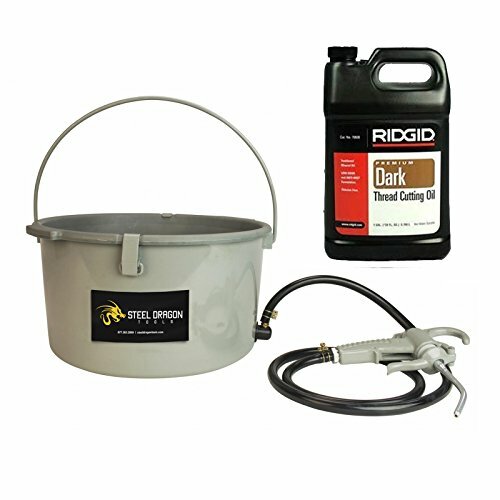 This package includes the Steel Dragon Tools 418 Handheld Oiler Bucket and one (1) gallon of RIDGID® Dark Pipe Threading Oil. The Steel Dragon Tools 418 Handheld Oiler Bucket is for use with pipe threading machines. This oiler bucket will fit compatible Steel Dragon Tools and RIDGID® pipe threading machines including the 300, 535, 700, 12-R, and 690. RIDGID® Dark Pipe Threading Oils is purchased in bulk by Steel Dragon Tools and repackaged in unmarked containers for distribution. Steel Dragon Tools provides quality threading oil while passing on wholesale savings. Works with RIDGID® 300, 535, 700, and 12-R Pipe Threaders. Provides 50 percent more oil per stroke than other hand-held oilers. Ergonomic two-finger trigger design reduces user fatigue. Die-cast body and swivel nozzle with no exposed parts. Convenient anti-slip grip design with integral hook for easy hanging. Heavy-duty reservoir withstands abrasion and will not rust. Integral molded body eliminates leaks at the hose/reservoir connection. Traditional high-performance mineral oil formulated to produce superior-quality threads on stainless steel and black pipe. Cools threads and pipe during operation. Speeds metal removal and improves thread quality. Oiler features Steel bucket with molded plastic chip tray. If you have any questions about this product by Steel Dragon Tools, contact us by completing and submitting the form below. If you are looking for a specif part number, please include it with your message.